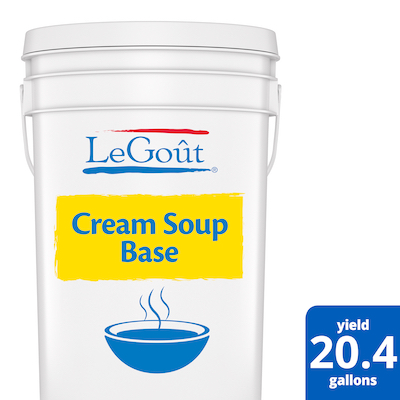 LeGoût® Cream Soup Base has a significantly cleaner formula that delivers smooth, creamy texture and rich flavor. Withstands heat in soups, sauces, dips and entrées—better than from-scratch. Deliver simple, clean food with ease. LeGoût® Cream Soup Base is reinvented by our chefs with your kitchen and your customers in mind. An invaluable asset for any kitchen, LeGout Cream Soup Base delivers exceptional performance and versatility that chefs can trust. This instant soup base withstands heat and resists breakdown better than a from-scratch base, making it ideal for demanding recipes. With its smooth, rich cream texture and delicious flavor, it is ideal for creating savory cream soups, white sauces, casseroles, chowders, and more. The cream soup base prepares in minutes; simply blend the soup mix into warm water, whisk until smooth, add other desired ingredients, and heat. To help minimize waste, this sauce mix can be frozen and thawed for easy reuse. 1. Gradually whisk sauce mix into water until smooth 2. Add other cooked ingredients if desired 3. Heat of 185°F for 1 minute, stirring occasionally. Do not boil.